The Minnesota Department of Natural Resources Adopt-a-River program removed 12,780 pounds of trash from the Mississippi River on June 17 near the Wakota Bridge in Newport and South St. Paul. "It was our biggest riverboat cleanup event in 12 years," said Paul Nordell, DNR Adopt-a-River coordinator, "and we're extremely grateful to the dedicated organizations and volunteers who made it possible." Unusually low water conditions in May exposed significant trash, including many mud-caked tires and decaying chunks of Styrofoam flotation material in stagnant backwaters. On June 17, some 140 volunteers arrived by riverboat, collected this trash and filled two dumpsters with it. Of all the trash collected, 69 percent was able to be recycled. 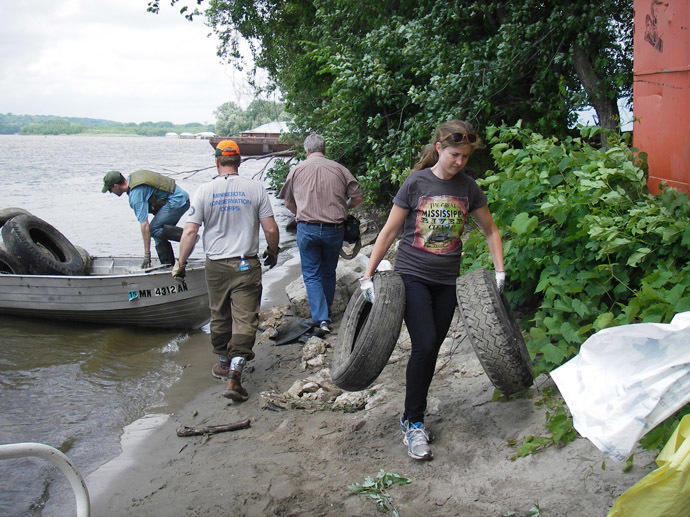 This Adopt-a-River cleanup is part of a statewide effort to maintain the quality of Minnesota's public waters and reduce health hazards. Street trash and open tires that wash into the river and land on its shores provide breeding sites for mosquitos that have been known to spread diseases. Nearly 200 tires (enough breeding sites to produce hundreds of thousands of mosquitos) were pulled from the river June 17 and recycled this past week by the Metropolitan Mosquito Control District. The cleanup was co-hosted by Padelford Packet Boat Company and Conservation Corps Minnesota, in partnership with Upper River Services and Living Lands and Waters. Further assistance was provided by the National Park Service and Tennis Sanitation, with cooperation from several other groups and many individual volunteers. Over the past 26 years, the Adopt-a-River program has hosted 3,500 cleanups at which 100,000 volunteers (hundreds of groups) have removed 6.5 million pounds of environmentally damaging rubbish on 12,700 miles of shoreline. For more information, or to get involved, visit www.mndnr.gov/adoptariver.